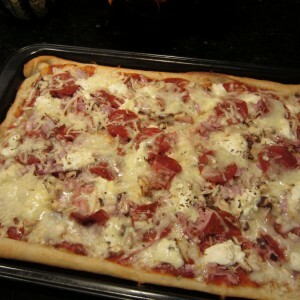 Unroll and spread out pizza dough onto a 10 x 15″ cookie sheet that has been lightly sprayed with non-stick cooking oil. Bake in 400 degree oven for 5 minutes and remove. Apply the pizza sauce over top of pre-cooked dough. Sprinkle with garlic powder, salt and pepper to taste. Evenly distribute the toppings onto the pizza dough placing the pepperoni as the final topping. Use a tablespoon to apply random dollops of low-fat ricotta cheese around the toppings. Sprinkle shredded low-fat mozzarella cheese over the entire pizza. Place prepared pizza back into 400 degree oven and bake for 6-8 minutes. TIPS: Makes 8-10 slices. Use additional toppings as desired. Suggestions include tomato slices, green pepper, black or green olive and soy crumble sausage. If cutting into eight slices, each slice is in the neighborhood of 175 calories.